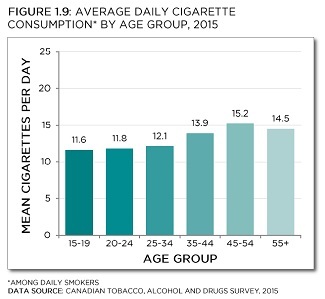 In 2015, average daily cigarette consumption varied significantly between age groups.18 Consumption was lowest among the youngest smokers, at fewer than 12 cigarettes per day (CPD) for smokers aged 15-19 and 20-24, and appeared to increase with age to around 15 CPD for smokers aged 45 and older (Figure 1.9). The same general pattern of increasing consumption with age (and often a slight drop after 55) held for most years between 1999 and 2015, although with some variation (Figure 1.10). 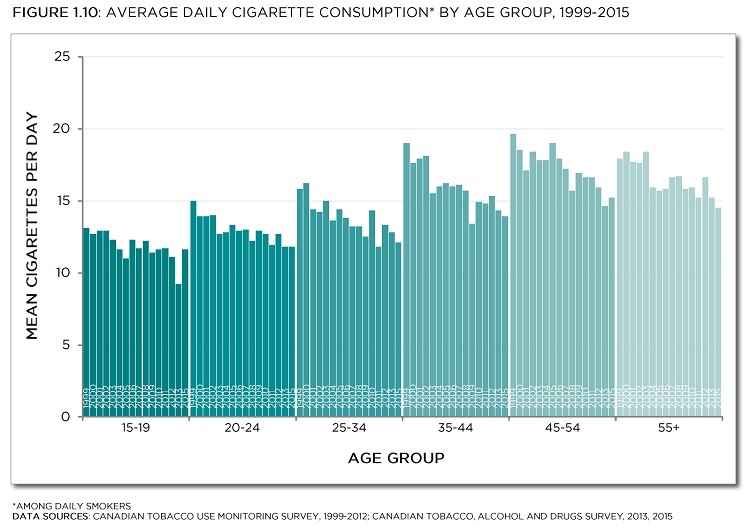 Between 1999 and 2015, average daily cigarette consumption appears to have decreased overall in all age groups.